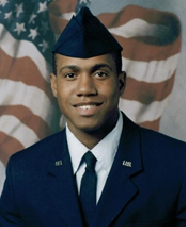 U.S. Air Force Senior Airman Michael Fletcher joined the military on March 16, 2004 out of New Orleans, Louisiana. He cites a deep sense of duty, and interest in making the military a career that he could be proud of as underlying reasons for enlisting. He calls joining the Air Force one of the proudest moments of his life. Senior Airman Fletcher was deployed to Iraq as a turret gunner on a Humvee. He was severely injured when the vehicle rolled over twice at Camp Bucca during Operation Iraqi Freedom. heavy machine moments later. Fletcher’s nose was ripped off, his orbital bones were crushed, and his left arm was severed at the shoulder. At the time of the incident, Fletcher’s wife Yolanda, who was also in the Air Force stationed in Alaska, was six months pregnant with the couple’s youngest son. He also suffered a broken palate, lost the vision in his left eye, sustained serious nerve damage to his legs, lost feeling in his toes, and lost several teeth. Medics restarted his heart twice during the medevac operation. Senior Airman Fletcher has undergone numerous surgeries. He had bone and cartilage taken from his chest, and skin and vessels from his forearm, for use in rebuilding his face. He has a 100% disability rating. Fletcher received the Air Force Commendation Medal, Air Force Outstanding Unit Award with one oak leaf cluster, Air Force Good Conduct Medal, National Defense Service Medal, Global War on Terrorism Service Medal, Air Force Longevity Service, Air Force Training Ribbon. The Fletcher family received a mortgage-free home in Miami in June of 2015.